The automatic sprinkler consists of assembly of a liquid filled glass bulb fitted in brass or bronze yoke with an deflector at outlet and threaded inlet connection. The glass bulbs are rated for particular temperature, block the outlet orifice to pressurise the downside of the alarm valve to keep valve closed in normal condition. In case of fire the liquid inside glass bulb expands and shatters the glass bulb to open the orifice and water under pressure starts flowing in the form of spray. In place of glass bulb fusible metallic string assembly is also used. Sprinklers are available in various temperature rating and selected on the basis of the temperature of the surrounding where they are to be fixed. The sprinkler system consist of water storage reservoir, a pump of suitable discharge capacity and pressure, normally installed near reservoir and delivery mains taken up to the area under protection in the proper distribution of pipe mains and branches. There is an isolating valve and a special valve (known as sprinkler alarm valve) on the delivery main near the area under protection. The valve is normally under closed position due to the pressure hold at down stream of the valve by sprinkler bulbs. The pipe branches are properly distributed over the area under protection to which the sprinklers are connected. Under fire condition the sprinkler bulb burst as the rated temperature arrives and releases the water held by glass bulb. Due to the pressure difference at the seat of alarm valve causes to open the valve to provide water to the sprinkler. As the valve get open it gives alarm with going connected to the system. The sprinklers continuously spray water at the seat of fire till the isolating valve is manually closed and reset the alarm valve. Being fixed system and automatic in operation, most dependable system. As the sprinklers in fire affected areas only operate, the water damage kept to the minimum. Sprinklers can installed even in concealed spaces, which are difficult to approach (like cable galleries in power station) which is great convenience in case of fire. Substantial reduction in insurance premium hence economical in long run. Very good for exposure protection. Since the response is quick acting the fire lost is minimum. As the system is automatic in operation it needs thorough maintenance. Not very effective unless entire area is protected. Most people question, the effectiveness of a Fire Sprinkler Systems. Also, there are a lot of misunderstandings about Sprinkler Systems. What are their specific advantages? How is it better than a Fire Extinguisher? or Can Fire Alarm Systems be used instead? This article will give you a clarity, about Fire Sprinkler Systems. How do Fire Sprinkler Systems Function? The “Sprinkler” is a heat sensing device. 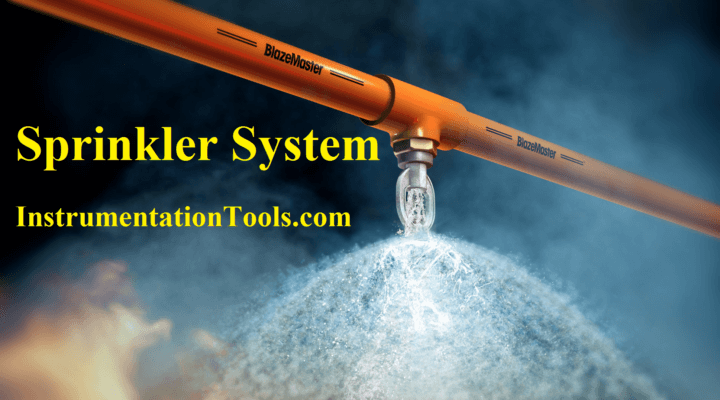 Sprinkler Systems are of various types, temperature ranges and designs. The heat sensing element (of the Sprinkler) is pointed to the floor or to the area most prone to fire. The other end of the Sprinkler is connected to a network of pipes storing water under high pressure. Usually from 7bar to 10bar. When there is a fire, near a Sprinkler; whose temperature is higher than the temperature rated value of the, heat sensing element in the Sprinkler. The bulb present inside the Sprinkler, or the heat sensing device bursts and water now flows through the Sprinkler Systems under pressure directly on to the fire affected area. All of this is automated and happens, within 3mins, of the fire being detected. In this way Fire Protection Sprinkler System is an automatic, Fire Detection and Extinguishing System. However, Fire Sprinkler Systems was originally meant for Fire Suppression only. Fire Sprinkler Systems are so designed to, be completely automated. This is their major advantage above all other systems. They do not require human intervention of any kind. The basic concept, is that fire will suppressed, at an infant stage. This will stop it from spreading. This is especially more advantages, if it is a residential project. As the Fire Protection System fights the fire, residents can be evacuated from the building. Hence, the chances of any person getting injured or killed because of fire, are very slim. Sprinkler System for Fire Fighting is a very effective method to suppress fire or the spread of fire. Fire Extinguishers are more effective when the fire is small and at an infant stage. However, even still; people have to actively risk their lives to stop the fire from spreading using Fire Extinguishers. Fire Extinguishers also require a relatively, higher maintenance. The chances of people getting permanently injured, due to fire is always present. All these disadvantages are neutralized for Fire Sprinkler Systems, which is the better Automatic Fire Extinguishing System. Again, Fire hydrant systems are manned systems, so there is a good chance people using the system might get burned or injured. Furthermore, it is not easy to operate a Fire Hydrant System. Fire Hydrants, have a limitation that they cannot be used for small fires, in an enclosed area. The force of water from the hydrant system if so great that, there are two people required to just, hold the fire hydrant. In fact, in some cases, Fire Hydrants cause more damage than the fire itself. This damage to the equipment maybe irreparable. This disadvantages are minimal or nil for, Fire Sprinkler Systems. The greatest disadvantage of the Fire Alarm System is that, it is a passive system. It will only warn you, after detection of fire at an early Stage. After taking, the early warning, you must evacuate the premises of the factory or residential complex. Here too, the Fire Sprinkler Systems System, wins hands down. Still, why should I go for Fire Sprinkler System? Because it is a 24 hour automated active system that does not require your help. It is a time tested, quality tested machine that will work for you, regardless. So, why would anyone not go for Fire Sprinkler System? “Budget” constraint is the major reason, period. This is because, some people have the perception that, their multi-million dollar investment is not prone to fire. One of the main reasons is that, people are not Fire Literate, they are completely oblivious to the dangers of fire.